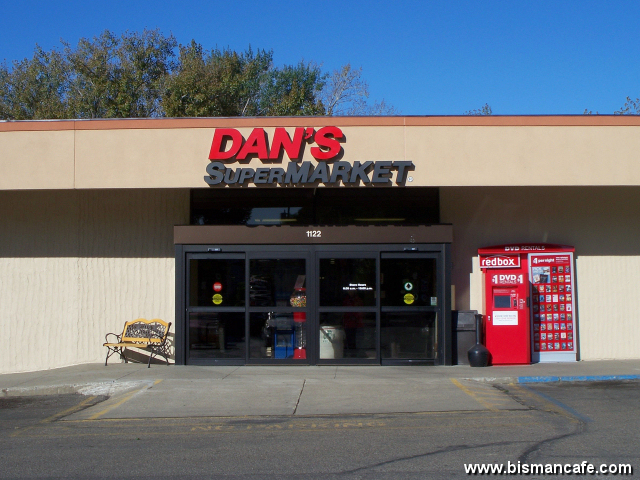 Dan’s Supermarket is a chain of grocery stores in Bismarck-Mandan that was founded in 1949. 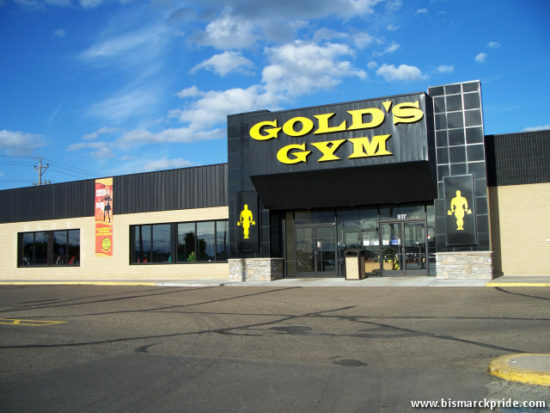 At its height, Dan’s owned and operated a total of 11 locations across North Dakota, South Dakota, and Wyoming. Today, the chain has consolidated operations to focus on its local roots. 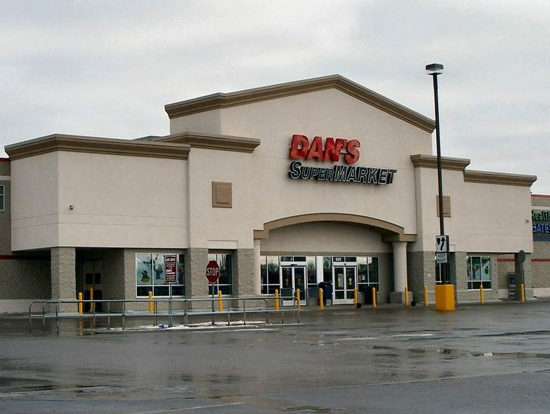 After nearly seven decades of local ownership, SpartanNash acquired Dan’s Supermarket in 2015, ending a long-time relationship with distributor Supervalu. The original Dan’s at Arrowhead Plaza closed in 2018 after more than sixty years. Dan’s has its roots back to 1949, when Roy Rockstad & Eugene “Bus” Leary purchased the local Piggly Wiggly at 621 Broadway Avenue and converted it to Bismarck Supervalu. Bismarck’s Piggly Wiggly had opened in 1931 at 502 E Broadway. It was purchased by Willie W. Oliver in 1939, when it relocated. In 1949, Supervalu purchased the Piggly Wiggly locations in Bismarck, Dickinson, and Mandan before reselling the Bismarck store to Rockstad and Leary. The nearby Mandan store was sold to Emily Moos and William Joersz, who also retained the Supervalu name (Bill’s Supervalu). Rockstad and Leary had been coworkers at National Tea Store, where Rockstad was market manager and Leary the store’s general manager. Prior to purchasing Bismarck’s Piggly Wiggly, Leary had operated his own grocery store, Leary Grocery, for 3 months, upon selling the store. Mrs. Cleo Berger was its first customer. Henceforth, she becomes the ceremonial first customer at each new store and remodel until Gateway Supervalu opened in 1981. In 1960, the original “Dan’s” at Arrowhead Plaza relocated to its present-day space when the mall expanded northward. It was previously located in the space that later housed Ben Franklin until its 2007 closure. In 1970, the company opened a south store between Bismarck Civic Center and Kirkwood Plaza, called Kirkwood Supervalu (relocated in 1995). The store held its grand opening in September. Its original Broadway location closed the following year. The new Kirkwood store was the city’s first modern supermarket-style grocer. It spanned 20,000 square feet and featured parcel pickup – a feature employed by Dan’s until the early 2000s. The store featured seven checkout lanes with full-service bagging. Customers could opt for parcel pickup service, where their groceries were placed in plastic totes to be claimed by plastic numbered cards upon pickup from their vehicle. 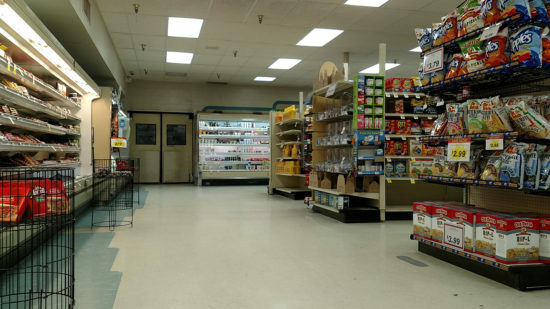 In 1971, the grocer expanded its operation to 24 hours a day at all of its stores. At the time, it included all locations. The only exception, initially, was Sunday mornings due to North Dakota’ Blue Law. Arrowhead was changed to midnight by the 1980s, but all others remained 24 hours until very recently. Its location on South Washington ceased 24-hour operation in 2017 for unconfirmed reasons. Its newest, Sunrise Town Centre, location is also not 24 hours (as of 2018). A north location, penned “Century Supervalu,” opened in 1975, occupying the northern section of the Kmart building that was formerly home to Kmart Foods (operated by National Tea). Six years later, the Kmart location was replaced with a 30,000-square foot freestanding store adjacent to Gateway Mall in May 1981. Gateway Supervalu was expanded to 49,000 square feet in 1989. The Dan’s Supermarket at Arrowhead Plaza completed a $500,000 renovation in 1987, the most recent major face-lift at that location (as of 2017). 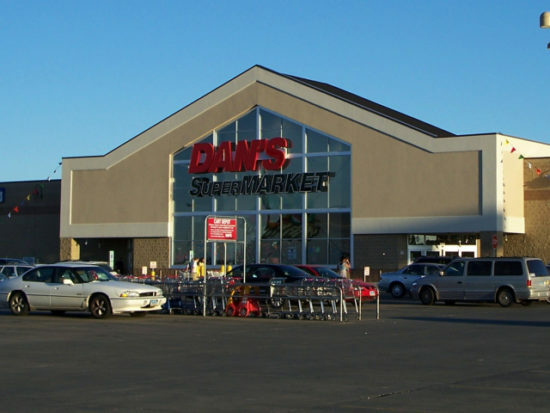 On July 4th, 1995, at a cost of $5 million, Dan’s opened a new store at 835 S Washington, replacing Kirkwood Supervalu. Despite dropping from its name, Supervalu remained the store’s primary distributor. The South Washington store was revolutionary for the market at the time, not only in size, but amenities. Spanning 65,000 square feet, it was the first local grocer built specifically to house a banking institution. Although, the first bank housed in a local grocer was claimed by then-Econofoods – by one month – through a remodeling effort to house a Bank Center First branch (now American Bank Center). The new store also featured a gift shop, coffee shop, and bakery with a separate entrance for fast and convenient shopping. For a short time, it also featured parcel pickup service, much like its Kirkwood and Gateway predecessors. Dan’s opened its Mandan location opened in March 1999. 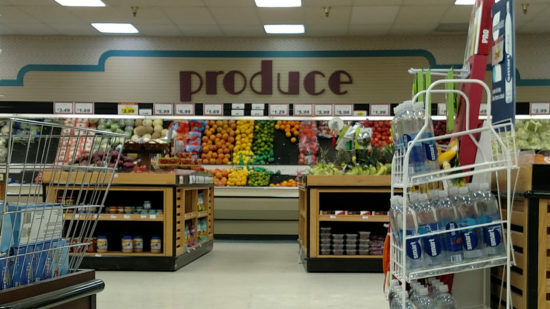 In March 2003, Gateway Supervalu was replaced by the present-day State Street store, which was officially branded “Dan’s Supermarket” to matches its siblings. At 61,000 square feet, the new store was 11,000 square feet larger than its predecessor, which itself had expanded over the years to 50,000 square feet from its original 30,000 footprint. Compared to its previous location, the new store had additional parking and better lighting. Dedicated sections were also set aside for Capital Credit Union and Gateway Pharmacy, who were later additions to the old store. When it first opened, the checkouts were designed to resemble streets, with street pole-style lights. 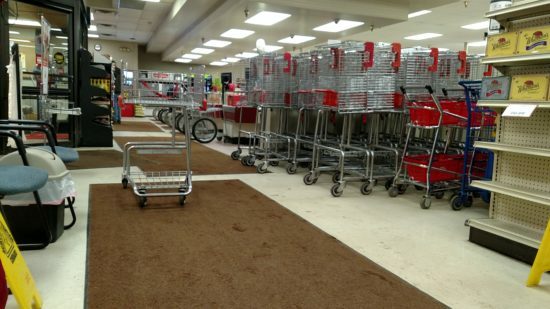 Its aisles were also separated by a center drive aisle down the middle of the store. These features have since been changed. 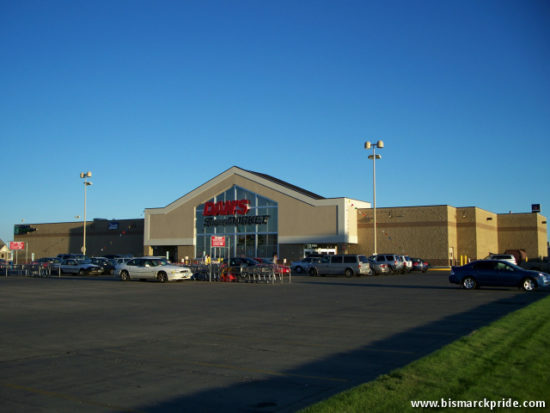 In 1980, Dan’s expanded its footprint beyond Bismarck for the first time upon purchasing and converting King’s Supervalu in Dickinson. A second Dickinson location was added in 1982. 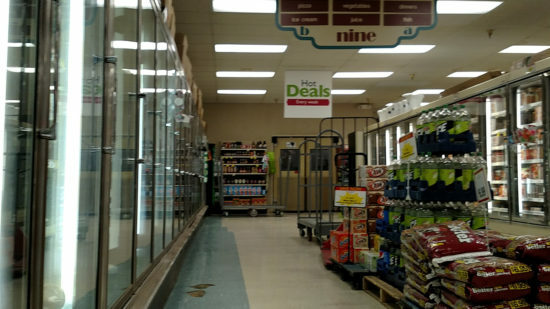 Both locations were sold to Nash Finch in 2013, who transitioned them to the Family Fare banner. 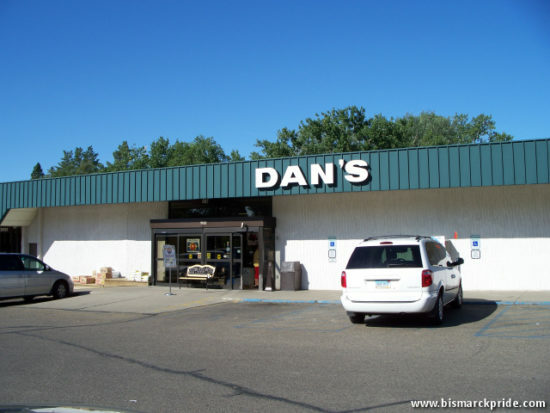 Dan’s also previously operated a store in Steele and locations outside of North Dakota, including stores in South Dakota (Rapid City) and Wyoming (Cheyenne, Sheridan, and Gillette). The Cheyenne store, which opened in 1986 and was expanded in 1991, was sold to Buttrey’s in 1996. 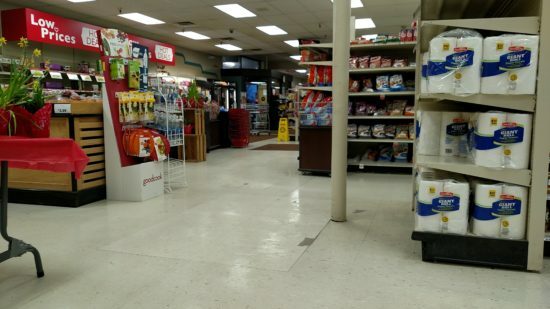 Dan’s remodeled its south store in 2011. 2013 saw three major developments for Dan’s. In April, the company announced expansion plans to anchor a new mixed-use development called Sunrise Town Centre in northeast Bismarck (opened in January 2015). In November, Dan’s sold its two Dickinson stores to SpartanNash Company. 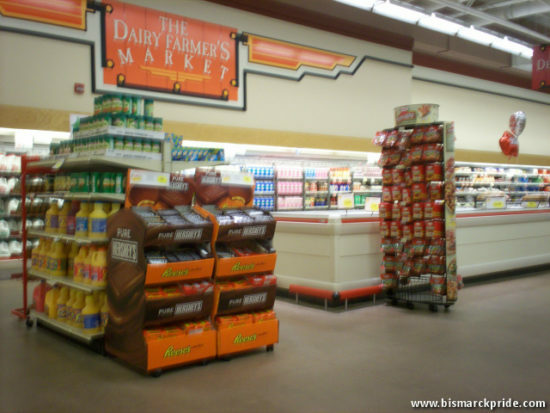 Then, in December, Dan’s purchased and converted the Bismarck Central Market store. The purchase excluded Central Market’s Mandan location – formerly Bills Supervalu, which shuttered soon after. In April 2015, SpartanNash announced plans to purchase Dan’s Supermarket. 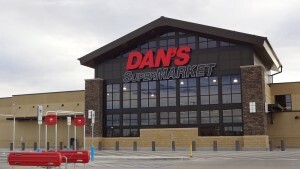 While the locations continue to operate under the “Dan’s” banner, they are now serviced by SpartanNash; ending a nearly seventy-year relationship with Supervalu. The State Street Dan’s was renovated in 2016. 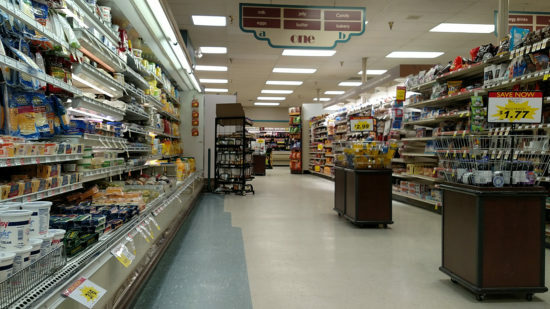 Changes included lengthening the aisles, which were previously separated by a center drive aisle, and adding a Caribou Coffee. 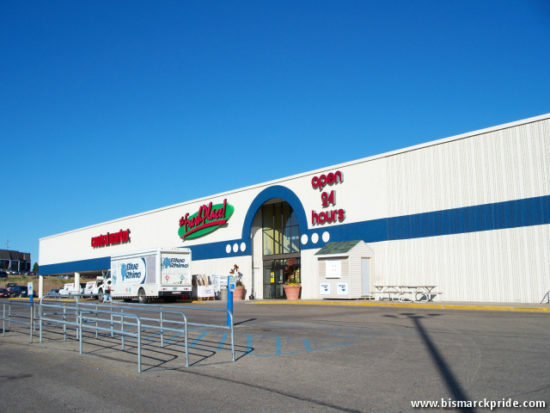 In early 2018, SpartanNash announced its intent not to renew its lease at Arrowhead Plaza when it expires October 1st, closing the long-time grocery store after 65 years. Arrowhead Dan’s closed on February 21, 2018 ahead of its lease expiration. For roughly twenty years, Dan’s Supermarket neighbored Walmart along South Washington Street. This close proximity of two competing enterprises sparked years of friction, including a legal battle. 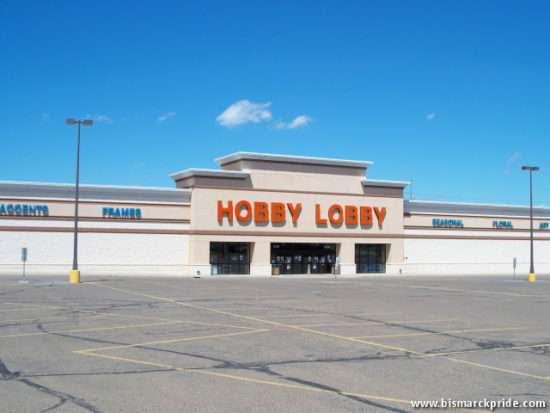 Despite opening nearly five years after Wal-Mart, Dan’s purchased its parcel of land two years prior to Wal-Mart – in 1987. Dan’s had opted to wait until improvements were made to Washington Street, including completing the Main Avenue underpass, before constructing a store. The land purchase included a restrictive covenant agreement that banned any direct competitor from operating on neighboring parcels for 20 years (through 2007). 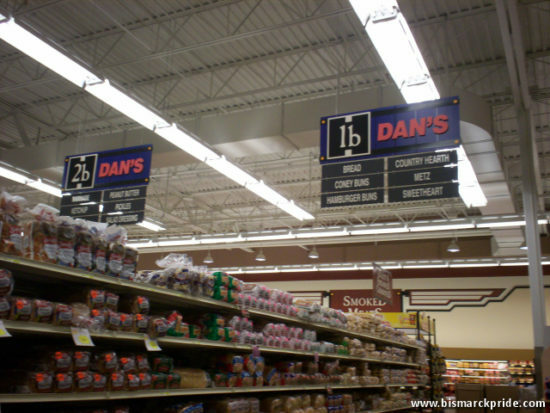 When Walmart proceeded with opening a store, Dan’s enforced the non-competitive clause. Dan’s was, at first, victorious in their lawsuit against Walmart, but the national retail chain won an appeal in 1994 – one year prior to Dan’s opening – that allowed for the sale of limited grocery merchandise. Frictions between the two retailers continued when an effort to directly link the properties with a permanent driveway was initiated by Dan’s prior to opening the new store. Without a physical barrier separating the properties, travelers soon created their own paths between the stores, in an effort to bypass busy Washington Street. An agreement was ultimately made in 1997, where Dan’s footed the entire construction bill and fully dropped the covenant restriction in exchange for a permanent connector. 1987 – Dan’s purchases land along South Washington Street, temporarily preempts construction. Dan’s also completes a $500,000 renovation of its Arrowhead location.